Although this was not a typical movie for her, Mary Ann wanted to see "The Hunger Games" because several of her friends recommended it. One difference for us is that this movie was being shown in a modern cineplex instead of a small old fashioned cinema in downtown Waterloo. The cineplex charged $12.50, and asked for a donation to some dubious charity on top of that. Then they bombarded us with loud wall-to-wall advertising after we sat down inside, something we both have a low tolerance for. But the movie itself was good, the time passed quickly. I was struck by the potential for propaganda in this movie. 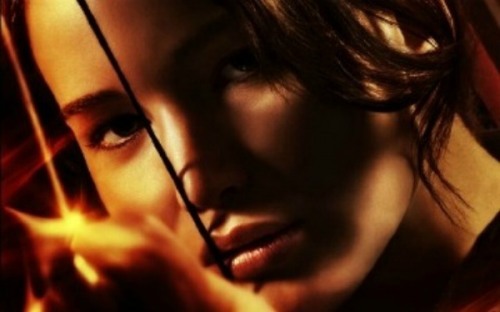 Like many movies I have reviewed recently, "The Hunger Games" has some powerful hidden messages. But the messages are a little too well hidden, and open to various interpretations. I will not have any spoilers, because the important messages are all in the set-up. There is a dystopian future for the USA, where the new country called Panem is ruled by a capitol set somewhere in the Rockies. 75 years before the time period of the movie, a rebellion was ruthlessly crushed by the people of the capitol, who brought the other 12 districts of the country under control so harsh that people are still starving. To add insult to injury, the Capitol district insists on "reaping" new victims each year for the "Hunger Games", a reality TV show that pits children from each district against each other in a fight to the death, for the amusement of the people of the Capitol, but all the districts are forced to watch, in order to remind them of their past naughtiness and to intimidate them into submission. I am not questioning the likelihood of a system like this ever working, as it is simply the basis for the movie's action. But upon watching the movie, and then googling some comments, this question come up. Is it possible that Obama's policies lead in this direction? Here are links to two different looks at the movie, one from an extreme right wing conservative website, "Voting American", with the title "Hunger Games: Is this a Peek into a Future in which the Liberals Rule America?" I have one other website, from a Libertarian, titled "The Hunger Games movie review - a glimpse of our own future if the cancerous growth of government is not checked"
The right wing extremist states that the "elites" are in fact liberals, while admitting that it is not stated in the movie whether the elites are liberal or conservative. And actually, not much more is said. So while the movie does not claim any right or left wing bias, apparently right wing people are able to somehow see Obama's hand in the downfall of America leading up to this dystopian society. The Libertarian review is much more thought out, actually. In point form, we are given a list of the ways that big government will lead to this new country. I actually have a harder time understanding libertarians than understanding conservatives. It seems to me that Libertarians are less connected with reality, maybe that's because they have never been in power except in their own minds. The main libertarian idea is that government and corporations are both evil, and that people must be free to do whatever they want, like the cowboys of the 19th century, when America was really great. And most puzzling, Libertarians think the best way to achieve this freedom is to vote Republican if no actual Libertarian is on the ballot. However, I do not agree with the analysis that says "The Hunger Games" are about socialist or liberal ideas leading to dystopia. Let's start with "Government Control". In general, the Conservative catchphrase "Government control" refers to taxing the rich to give to the poor. And while conservatives don't consider military, police or harsh punishments being part of "Government control", it's quite obvious that the problem in Panem is primarily to do with police, military, and harsh punishments. These are not liberal policies, as liberals are often criticized by Conservatives for being too lenient. These are Conservative militant policies. One only has to look at the conservative support for Israel against Palestine to see the they have no problem with the basic idea of punishing a whole people for a past rebellion, with poverty, districts walled off, control of food, land and technology. If anything, Liberals are in favour of giving health care to the poor, giving welfare and unemployment insurance, government pensions, subsidized colleges and housing etc. Then liberals are in favour of taxing the rich to do this. I'm pretty sure if the people in Panem District 12 were allowed to vote (another "liberal" policy - conservatives like to prevent poor people like Palestinians from voting), they would in fact vote for Obama. The one clear indication I see in the movie of Liberal control is that the environment seems to have been saved from the destruction of global warming. But then since conservatives believe that global warming does not exist anyway, this would only have meaning to environmentalists. My own view is that this movie is not so much about conservative ideas of government control or regulation, as it is about liberal and socialist ideas of the class war between rich and poor. And apparently the message is hidden well enough that many conservatives and libertarians don't get it.